It feels like we’ve known about Microsoft’s Mixed Reality headsets for the longest time, but at Build 2017 we’re finally getting our first look at the VR controllers. 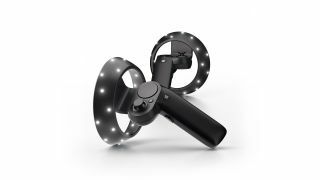 Windows Mixed Reality motion controllers might look similar to those we’ve seen from the Oculus Rift and HTC Vive, however, it doesn’t need a tracker. Rather than setting up light boxes IR cameras, sensors in the headset work in tandem with the motion controllers to deliver precise sub-millimeter control and responsive tracking of movement in the user’s field of view. It’s a far simpler setup we appreciate and given the lower hardware requirements of Microsoft’s Mixed Reality platform, we might actually be able take to a friend’s house and share. Unfortunately, Microsoft decided not to demo the Windows Mixed Reality motion controllers on stage, so we won't get a good look at how well they work until we get some hands on time with them. What’s even, more impressive about this whole setup is the Windows Mixed Reality motion controllers on stage with Acer Mixed Reality Head-Mounted Display will come bundled together for just $399 (about £310, AU$540) – and the bundle is available for pre-order right now and will arrive this holiday. Microsoft also announced developer versions of the Acer and HP Mixed reality headsets on their own are also up for pre-order on the Microsoft Store for $299 (about £230, AU$400) and $329 (about £250, AU$440), respectively to release this summer.